A loan of $10,000 helped fund women artisans to purchase materials, produce crafts and wages and enable sales in the U.S. market. I was born in Segou, Mali from 13 children. Both my grandparents were businessmen, one in textile and the other in commodities. I could observe them counting money after market day, from that on, I decided to own my own business. After sending my kids to college, I took a training class at the DC Women Business Center (WBC) and opened my art gallery. It was inspiring! I I won the Verizon Entrepreneurial award by the WBC. For 15 years of crafts development with African women artisans I have served low-income artisans and promoted opportunities to create income-generating solutions through entrepreneurship. I believe that a small contribution to the life of others less fortunate can lead me to my own life fulfillment. My desire is to expand, reach out to the U.S. tradeshow buyers while training artisans in Africa and prepare them to produce quality export-ready crafts for the U.S. market. Completing my MBA program with focus in sustainable business at Marylhurst University complement these goals. Exposed to USAID-funded projects as a Volunteer Expert in Africa for economic and sustainable development, I was inspired by the talent of many women artisans who continue their ancestral traditions despite hardships. From 2004-2018 I have conducted a series of programs in marketing and product development in Ghana, Benin, Lesotho, Sri Lanka, Swaziland, South Africa and soon in Mali. In 2012 I spent in Sri Lanka assisting war-affected women weavers to develop new handloom products for U.S. export. As a result, I received the following awards for my civic participation. It helps a woman entrepreneur expand the inventory of traditional artisans, thus providing jobs and supporting fair wages thru her artisan business. Haoua Cheick Seip Businesswoman and consultant in crafts development and artisan entrepreneurship! “I’ve fulfilled one of my own dreams by owning an import-export business—I want to help other women do the same” The talent and determination of the African woman Entrepreneur inspire me!!! “I’ve always been impressed by the strength of the African woman entrepreneur! I am proud of watching her design her own products and support her family despite hardship conditions. I, too, struggled for many years, but was determined to take charge of my life and earn my own income. One of my dreams was to market products, made by African women, to clients throughout the world” I am a social entrepreneur and an international volunteer who fosters groups from the village stall to the global market. Over 10 years, my goal has been to identify, bring social change and impact to communities about its potential, and capitalize on new business opportunities for women entrepreneurs in developing countries. I maintain a network in U.S. tradeshows and special venues like the African Film Festival in Portland, OR. In 2014, I created The Women Artisans Resource Enterprise (WAREE) to promote women crafts groups. I am currently an MBA candidate with focus in Sustainability at Marylhurst University. I will be soon leaving as a Volunteer Expert for Mali to provide a mentorship training to women entrepreneurs in the agri-business sector. The program is sponsored by USAID and the Swedish International Development Agency under the Feed the Future Initiative. I like to borrow $10,000 from KIVA to provide an opportunity for women groups to increase their crafts production and have more visibility at U.S. tradeshows where they will access to U.S. buyers around the country. The loan will cover marketing materials, design a website and the tradeshows attendance fees. This loan will allow me to train and promote the development of crafts from 4 traditional African artisan groups and help them strengthening trade relations between Africa and the U.S. Four particular women groups located in Mali, Niger, Zambia and Zimbabwe have products market ready. We import Mudcloth, baskets, gorgeous leatherworks and traditional beads. The loan will provide raw materials ($4500) to generate substantial inventory designed for U.S. trade shows, cover labor costs & training ($3000) and attendance costs at trade shows ($2500). The impact of the loan will result in a tremendous improvement in women's livelihood, their family and the communities. Why are you endorsing Haoua? I met Haoua at the African Film Festival that occurs each year in Portland, OR. at Portland Community College. 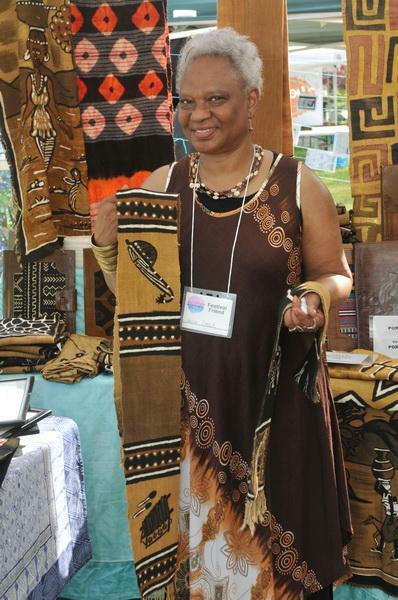 Haoua was representing and selling gorgeous African crafts from artisans in Mali, Kenya and Uganda. The crafts were so remarkable, and Haoua was so engaging herself that I sought the story behind the museum-worthy wares she was marketing. She unfolded before me an amazing 10-year journey to assist the women in Africa learn artisan skills and business skills in order to better support their families and strengthen their communities. Our relationship blossomed from there. With Haoua's extensive training (BA in Business, MA in business in progress), 10-year extensive business experience & expertise doing what she is doing now, in addition to an exemplary humanitarian spirit shown in her commitment to helping others- she has combined common sense, professional training and outstanding achievement to be a rock solid candidate for a Kiva loan. Her work is in direct alignment with Kiva's mission! Let's all support her and the women artisan's!